Share the joys and struggles of life in the most natural way possible—by sharing stories! Storycatching is a wonder-sparking set of 80 storytelling prompts. The cards are quirky, surprising, occasionally edgy and perfect for making your mind buzz with memories and creative possibilties. 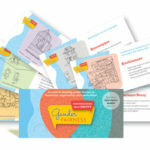 From the classroom to the Scouts’ Hall, from counselling scenarios to long drives in the car, these cards are ideal for unlocking the stories of people of all ages! Workshop opener: Lay the cards out on a table or on the floor where participants arrive. Ask each person to select a card that prompts a story about why they are at the workshop or what they hope to get out of the workshop. Alternatively, use Storycatching as an opener to a meeting or gathering. Listening: Working in pairs, invite each participant to choose a Storycatching card. Each participant has two minutes to tell their story while their partner simply listens without interruption or comment. How good are we at really listening? Creative writing and journalling: Choose a character from a card. Maybe it’s the elephant about to leap, the bad hair girl, or the embarrassed manikin. Create a dialogue between two or more characters. Or write a monologue from one character’s perspective. 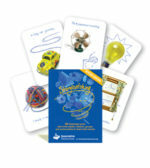 Memory game: Lay out all the Storycatching cards on the floor or table. Have everyone in the group scan them for a minute. Now turn them all face down. Ask everyone to write on a sheet of paper as many of the objects from the cards as they can remember. How many can you remember? 10? 20? 40? Like any set of cards that are used for conversation building or story prompting, the ways in which you use Storycatching will be driven by your purpose, passion, curiosity and creativity. Storycatching covers a wide range of subject matter and emotional territory. It is a simple and versatile resource that does not require any special training to be used. Teachers, youth workers, parents and creative arts therapists: here’s the resource you need to get young people telling stories and reflecting on their thoughts, feelings, memories and attitudes to life! ‘I am a secondary school English teacher working in a fairly tough Western suburb of Sydney. I’ve tried quite a few resources to inspire the students over the past couple of years but they can be a hard group to get through to. It is very hard to engage the students in writing exercises and even harder to get any verbal feedback. At the end of last term I introduced the Storycatching cards to my VCE English class and the response took me by surprise. The stories flowed very naturally among the students and they went on to write some wonderfully honest and free-flowing prose about the cards they’d chosen. ‘I bumped into an Innovative Resources product recently in a most unexpected place and wanted to let you know what an amazing experience it was. My partner and I were at a friend’s 50th birthday party. Later in the evening, when the time came for speeches etc., our host (the birthday boy’s wife) brought out a set of Storycatching cards. She spread them on the table and asked everyone to choose a card that reminded them of a story about the guest of honour. There were more than a dozen people sitting around the table and EVERYONE told a story. There was lots of laughter, and even a few tears. Our friend was incredibly moved by the stories people told. Even after the formalities were over, people continued to play with the cards and share stories. ‘My wife recently bought a set of the new Storycatching cards to use with her Year 8 English class, and I was really impressed with them. So impressed in fact, that I snuck them into my briefcase and took them to work before she’d even had a chance to use them. We were interviewing for three new positions on our local council and I thought it would be good to try something a little different. I spread a selection of the cards on the table in front of each applicant and asked them to choose a card that reminded them of a funny/stressful/unusual situation that had happened in one of their previous work places. I then asked how they dealt with the situation. It certainly created some interesting results. Two of the applicants were a lot more relaxed after the exercise, while the other found it bamboozling and was really thrown by something so left of field. It was a real eye-opener and created a whole new dynamic in the interview room. From a HR perspective it was invigorating. ‘I thought I’d share with you a fun activity I did with my Year 7 home group recently. We used two packs of Storycatching cards, shuffled them and spread them out on the floor to play ‘memory’. The students took turns and each time they matched a pair had to tell a story to the rest of the group based on that card.